If you haven’t seen the new ad yet, I am certain you will. Emily’s List and their front group Wisconsin Women Vote! think the only way they can win is by sharing false claims about what was or was not included in Sonya’s Law. In the most recent ad from this group, they want the viewer to believe a woman will be mandated to receive a certain type of ultrasound. In fact, they put a biased headline in their ad which no credible newspaper would ever use! For anyone who has taken a moment to read the law they will see that a woman can decide on the type of ultrasound she wishes to have. Those who opposed this legislation are now trying to take the conversation to the very place they tried taking it during the debate on passage of this bill. With the recent results from the Marquette Poll, perhaps these groups realize the gender gap advantage that once was theirs isn’t as big as they had hoped for. 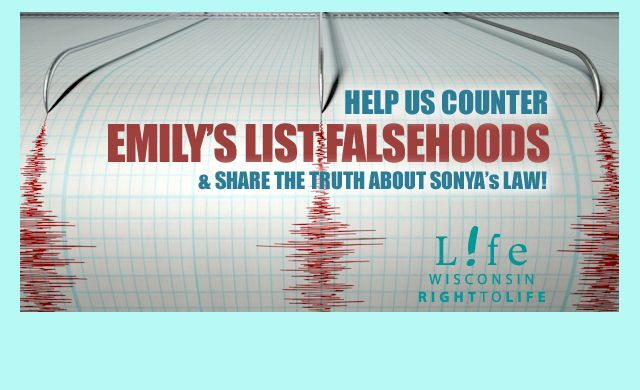 Extreme pro-abortion groups that weren’t able to defeat Sonya’s Law at the time of its passage are now scared that more right-to-life laws will be passed in the near future. We all need to do our part in ensuring people know the facts. Sonya’s Law is all about the health of both mothers and babies.